In 2017, Aalto University continued the renewal of the its research profile and advanced the digitalisation programme. 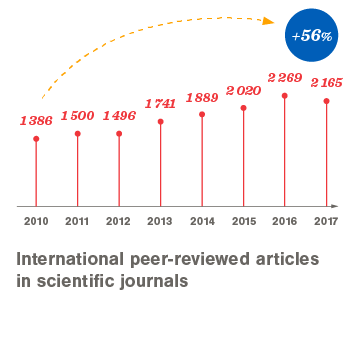 Competitive research funding increased. The innovation ecosystem evolving on the campus received wide international recognition. Aalto University has seven key research areas, which relate to promoting competitiveness and welfare. 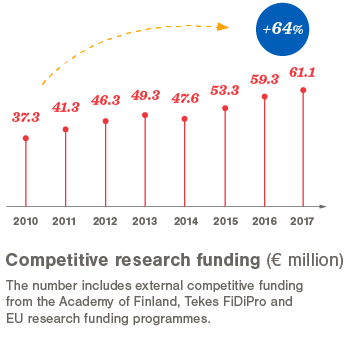 Recipients of European Research Council (ERC) funding up from 6 in 2010 to 26 in 2017. * The FiDiPro funding programme has been ended. The tenure track career system is the university's most important strategic investment. 63% of all professors are recruited after 2010. *New professors refer to professors appointed to the Aalto University tenure track career system that was implemented in 2010. Aalto University educates game changers. 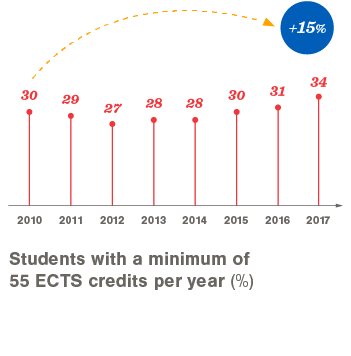 In 2017, the university focused on programme attractiveness, online learning, success of students and professional competencies. 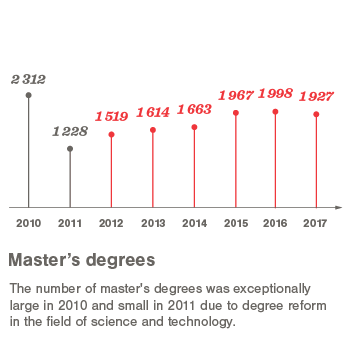 The number of doctorates has increased by 39% compared to 2010. Aalto University wants to increase visibility and impact of art and creativity in the society. This will also create a basis for change and new thinking. The QS Rankings put Aalto’s art & design to 9th place worldwide. Aalto is committed to the percentage for art principle as the first university in Finland. with major events: Flow Festival, Helsinki Design Week, Paris Photo, National Portrait Gallery London, Pitti Uomo, Milan Furniture Fair. The Business of Fashion ranked Aalto’s Fashion Programme as 5th globally. For the 6th year in a row Aalto students were finalists at the Hyères Fashion Festival. Aalto’s students have excelled in the annual Designer’s Nest competition for consecutive years. 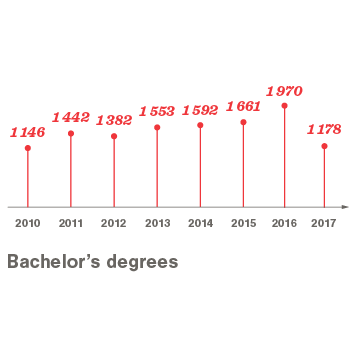 Aalto University places high among universities in rankings specific to science, technology, art and business. In 2017, QS put Aalto in 7th place in the world among universities founded less than 50 years ago. Aalto University is developing its main campus into a unique centre of cooperation that attracts partners from all around the world. Sustainable development and responsibility are at the core of Aalto University’s strategy and shared values. 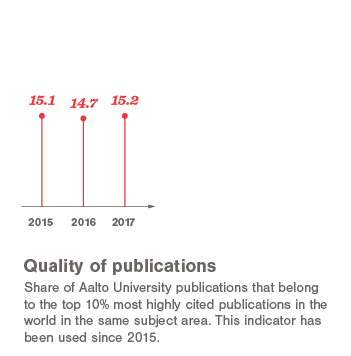 Sustainable development was the topic of 12% of all publications at Aalto in 2017. In addition, numerous research projects are linked to sustainability via e.g. utilisation of research results. See other key figures in sustainability and Aalto University's sustainability reports. 37% of the academic faculty is international. 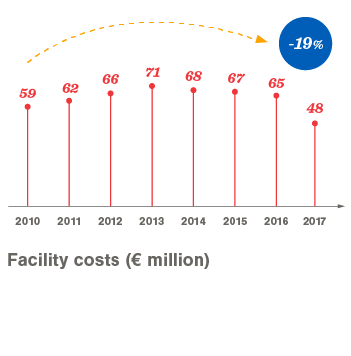 The financial balancing plan implemented in 2016 has been successful: the amount of competitive funding has increased and the university has been able to save in faclility and personnel costs as well as purchases.